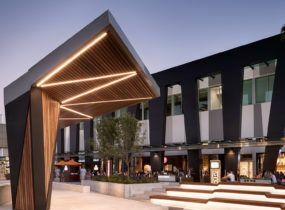 The revamped centre integrates into the surrounding community, creating a true lifestyle experience for locals. A collaboration between Buchan and Lendlease Design, the $350 million expansion transforms the centre into a leisure destination. Now it offers more than just a diversified retail mix. Buchan’s design draws upon a greater city related master plan, strategic environmental response and a subtle recognition of the original architecture. The design relationship between the exterior and interior seeks to create an innovative and dynamic retail architectural solution. 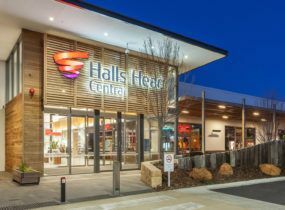 This is complementary to the original shopping centre. It creates a new contemporary aesthetic specific to the community. A magnificent and striking visual geometry and angular disposition define the centre. 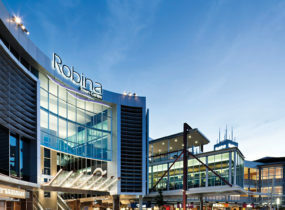 Internally, the main fashion mall delivers a refined and environmentally responsive aesthetic. It features suspended sails designed to control and disperse natural light. The expansion includes a new Myer department store and 95 local and national retailers. 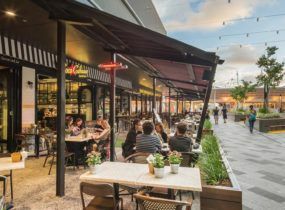 It also includes a new first-floor fine dining precinct, the revitalisation of Station Square, a vibrant new alfresco dining precinct that has improved connectivity to the existing rail and bus interchange. Our graphics team also delivered a wayfinding strategy and signage program which referenced the bold forms of the façade.